A little while ago, I bought a robotarm for MSX gekocht on the Dutch trade site Marktplaats. The robotarm did not work correctly and some options malfunctioned. Lucky enough Emil (Roadfighter), also member of the MSX club Mariënberg, managed to repaired it for me. The robotarm is working 100% again now. I'm very happy with it. 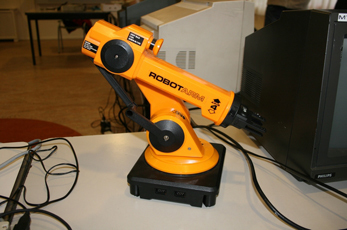 The SVI 2000 is a robotarm developped by Spectra Video. You can operate it with two joysticks or with the help of a rogo cartridge on MSX. 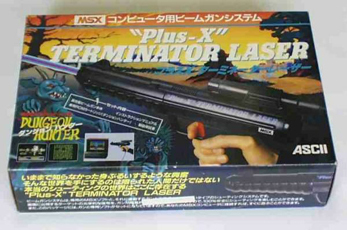 The robotarm package did not included this cartridge at the time. 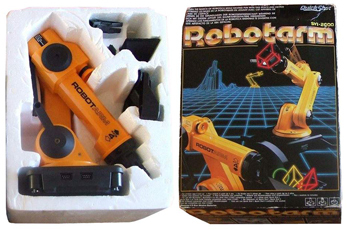 And also when I bought the robotarm the rogo cartridge was not included. That's why I'm still looking for a rogo cartridge. Please mail me if you have got one for sale for me. UPDATE: Recently on the MVM MSX aution I bought a robot arm with rogo cartridge and a loose rogo cartridge. So I have 2 (!) rogo cartrigdge now! I will have some experiments with it. Soon a report about it on this website.